"As a museum building, the Alte Pinakothek was the product of a fruitful collaboration between two specialists on whom the King was able to call -- the architect Leo von Klenze and the then director of the gallery, Johann George von Dillis. Much of their pioneering thought still makes itself felt today, from the now clearly obvious division into large halls and smaller cabinet-style rooms, plentiful daylight in the interior, and overhead lighting, which frees up wall space for paintings and ensures illumination without dazzle. The way in which paintings are presented in most art galleries in the world can also be traced back to the ideas of Dillis and Klenze." Johann Georg von Dillis was more than simply an artist. He was a professor of landscape painting at the Art Academy in Munich and director of a gallery. He accompanied Ludwig on trips to France and Italy and negotiated purchases for him. He cultivated close contacts with prominent contemporaries in the art circles of Rome, Florence, Milan, Paris, Vienna and Prague. He advised Ludwig on artistic matters until the end of his career. 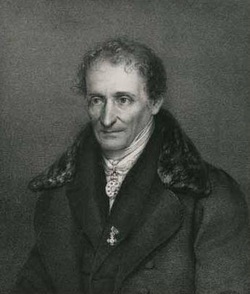 Born December 26, 1759 in Upper Bavaria, Dillis was sent to live with his brother in Munich so that he could attend the gymnasium. He was educated through the assistance of the Prince Elector Karl Theodore, a lover of the arts who liked to promote himself as a prince of peace. Dillis taught drawing at court and was appointed director of the Hofgarten Gallery in 1790. In 1806 Dillis and Ludwig journeyed to Paris to inspect the Louvre Museum, which had been opened by the leaders of the French Revolution in 1793, and they came away with ideas for the Glyptothek and Pinakothek.